A new Western-themed has some area residents worried about additional late-night activity. This spring, students wont have to drive all the way to the Stockyards to experience a true taste of Cowtown. The new Western-themed restaurant, Gunsmoke Grill and Saloon, will be opening in the heart of the TCU area on Cockrell Avenue, right behind Fuzzys Taco Shop. 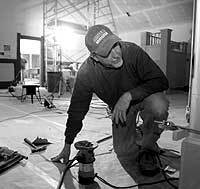 Construction began about a year ago, but an exact date for completion has not been set, said Travis McKnight, owner and operator of Gunsmoke Grill and Saloon. He said he hopes for it to be open in April. Neighbors who live near the location of the restaurant are worried about possible trash and late-night activity the restaurant could bring, said Keri Ryan, president of Bluebonnet Place Neighborhood Association. If he wasnt open late, it wouldnt be a concern, Ryan said. Construction continues on the new Gunsmoke Grill and Saloon, located behind Fuzzys Taco Shop on Berry Street, which owner Travis McKnight hopes to open by April. Broadcast journalism students will now get experience performing all the roles involved in an newscast environment. Broadcast journalism students will anchor, report, produce and edit a weekly 30-minute newscast that will air on TCU cable under a new class planned for next semester. The House of Student Representatives wants students to be able to use their meal cards at local eateries. A burger, fries and a drink in The Main: $4.47. The same meal at Wendys: $3.89. Being able to eat out on send home: priceless. Bushs proposed budget is the worst of both worlds, combining both huge deficits and draconian spending cuts. The hidden spending and irresponsible tax cuts represent a mockery of governmental management. There is a presidential election coming up and, as usual, there are no progressive candidates with a chance of winning. What a joke it is that the white boys going for the Democratic Party nomination are branded as liberals as if that were an insult. Chad Huffman had a game hell never forget Thursday night. The Frogs are one victory away from a feat the program has never accomplished in Conference USA. The Horned Frogs dont have the attitude youd expect from your typical 8-11 team.